Raederle: My stomach hurts after everything I eat! What should I do? My stomach hurts after everything I eat! What should I do? "My stomach has been hurting after everything I eat. I'm at a place where everything feels potentially harmful. What should I do?" My condolences. I've been there, and it's rough. The good news is that I've recovered and that you can too. For three years I suffered terribly after every meal. What changed? I started to learn the specific causes of the problems. It seemed like everything was causing me pain. However, most of my meals involved ten or more ingredients. If I ate ravioli and got acid reflux, burning sensations in my stomach, etc, what caused the pain? The cheese? The sauce? The seasonings? The pasta? You don't need to suffer any more. Stick with me through this page and you'll have the information you need to heal and feel good again. Digestion: How to eat to lessen the load on your digestive system. 1. These times are accurate for the item eaten alone. 2. Combining foods makes the time increase dramatically. 3. The less healthy the digestive system, the slower digestion is. 4. The listed times above are for a healthy digestive system. Using the digestion times above, you want to emphasize meals from the beginning of the list. Melon for breakfast is excellent for healthy bodies and okay for many people with a struggling digestion. If melons upset your belly, go for berries, cucumber, celery, or bell pepper. Then for brunch, if you eat one hour after the melon, you're giving (in theory) forty minutes of stomach-clean time before eating again. The reason why this is "in theory" is because digestion times vary for every human, and every condition. For brunch, you could eat berries and an apple. Again, if you have a condition (such as diabetes or hypogycemia) which prevents you from eating an apple by itself, you can add celery for added fiber or substitute this recommendation with the other mild foods mentioned above. Plain romaine lettuce is also great for breakfast and brunch. If you eat again two hours later you get an-hour-and-a-half of stomach-clean time. If for lunch you eat a salad and some cooked starchy greens (like boiled yams and carrots), it'd take around two hours to digest, so you'd want to wait four hours before eating again. If your stomach hurts after apples, citrus fruits, melons, or other fruits, then your body's flora is probably out of whack. Show me a diabetic, and I'll show you severe flora imbalance. Having struggled with flora issues since birth, I can relate! Increasing probiotic intake combined with cleansing, and starving off bad bacteria can remedy this issue – but it's not an easy path. It takes at least six months to re-balance intestines. There is no quick fix. When balancing bacteria in your gut, you're building a colony. Think of it like founding a city. Cities can not be built in a day! To build healthy flora, there must be good bacteria coming in. Today, the place to get good bacteria comes from fermented foods. In the wild, animals get good bacteria from rolling in the dirt, drinking from streams, and eating un-washed, wild foods. Because we're no longer wild animals, we require a daily intake of fermented foods. This is why the macrobiotic diet has fermented food at every meal, because healing from cancer (or any condition) requires healthy bacteria balance in your body. While yogurt is what people often turn to, it often is the least effective option. The milk is pasteurized before fermenting, which means the natural probiotics present in the cow are not present. This is a good thing if we're talking about factory-farmed cows, because their milk might make you sick otherwise. Ideally, any dairy consumed would come from well-loved animals that graze on grass, and the dairy would be rich with probiotics and enzymes naturally coming from the animal. Since that isn't a readily available option for most people today, I recommend avoiding dairy entirely – especially if your stomach is hurting regularly! Site note for those who love dairy: If you really feel the need for butter, that is generally okay in small amounts if organic, and consumed in small amounts with vegetables. Natural butter is much easier on your body than its lab-made chemical substitutes. But note, it takes an hour to digest 10 grams of fat in a healthy digestive system! One stick of butter is 92 grams of fat. When I was growing up, we put a whole stick of butter on the popcorn which my dad and I split. That meant 41 grams of fat each, which equates to four hours to digest the butter alone – not counting the added complexity of digesting the popped corn which is loaded with acrylamide (which we'll discuss a little later on). The above items all contain different blends of flora, which are also, in turn, different from the flora found in dairy kefir and dairy yogurt. While there is also soy yogurt and almond yogurt available in stores, these are often full of suspicious thickeners and other unsavory ingredients that won't boost your health. The significance of the difference in flora between fermented foods is many-fold. It means that eating sauerkraut will not provide the same benefits or results as kombucha or miso. In my experience with my clients, there is usually one fermented food that will help more than all the rest, but it will vary from person to person. One woman I met had tried making her own sauerkraut, but this didn't help. She owned a seaweed company and ate buckets of of nori, laver, spirulina and other sea-vegetables, and incredibly, that didn't solve her digestive problems either. She tried making her own water kefir, which didn't do the trick. And then, finally, she started making her own kombucha, and finally, her stomach flattened, the gas stopped, and she could eat a whole foods diet without having to worry if a baked starchy meal would give her indigestion. In my case, kombucha has also been the answer. For my husband, tempeh has helped a lot. For another woman I know, natto has been very key to her healing, especially because this one of the richest sources of vitamin K2, which is the vitamin that directs your calcium to your bones. Whether you have enough vitamin K2 or not is the differences between calcium in your arteries and calcium in your bones (where it belongs!). But wait! Fermented food hurts my stomach! This is unfortunately common with digestive disorders. For example, say you have low stomach acid. This can mean that you are more vulnerable to helicobacter pylori, commonly known as H pylori, which likes a more alkaline environment than the typical healthy stomach. If you have H pylori, then every time you eat something acidic the H pylori will be very unhappy and start producing extra ammonia (which is alkaline). Ever seen baking soda combine with vinegar? That's what starts happening in your stomach when you eat acidic foods and you have H pylori. This is very uncomfortable, but it actually helps get rid of the unwanted bacteria. To fully remove H pylori is quite the trick. You may want to opt to get antibiotics to take care of it, but if you do, be sure to take a lot of probiotic supplements in addition to fermented foods at every meal. This is vital if your internal flora colony is going to be healthy. Fermented foods can also cause gas. Probiotics are bacteria. Bacteria eat things and then produce some sort of excrement. Probiotic excrement is good for you generally, but sometimes gas is involved, which is uncomfortable and not good for you in the long-run. Prolonged gas that goes on and on for days, where you're very bloated and uncomfortable, distorts the intestines. This distortion provides pockets where bad bacteria can hide, becoming even harder to clean out with fiber and probiotics. That's where juice-cleaning comes to the rescue. If fermented foods give you discomfort and gas, it may be best to start with an "elimination diet" where you eat only foods you know give you absolutely no symptoms whatsoever. I recommend including cucumbers, celery, lettuce, sunflower seeds (in small amounts), chia seeds, flax seeds (ground in your coffee grinder or vitamix), small amounts of fresh-squeezed lemon, peas, organic tart apples, boiled potatoes, brown rice, steamed kale, and small amounts of apple cider vinegar. If you feel the need for meat, stick to free-range, organicly-fed animals and stay away from any part of the cow or pig. Also, be sure to not eat anything sweet with your meat or any time in the day after the meat. If you have a nut allergy or any seed allergies, and have not yet tried flaxseeds, do not include them in your elimination diet. Flax is a fairly common allergy, although not nearly as common as sensitivity to peanuts and corn. Speaking of which, stay very clear of peanuts, corn, and wheat! After one week symptom-free, add in one fermented food. I personally have a bias toward kombucha (since that's what worked for me), and recommend trying kombucha first. Drink it slowly! Gulping kombucha will give most anybody gas, even if they have a healthy body. Drink 16 ounces of the course of an hour or two. Like fine wine, kombucha should be sipped and savored. Also, do not consume kombucha with fruit or with large meals. It is best consumed beside light snacks, very small meals or by itself. The chances are that your body will experience mild discomfort from any fermented food even after a week of clean-eating, even if the fermented food is good for you. Take note of everything you feel for 24 hours after consuming the fermented item. If nothing more severe than mild burning or one or two farts occurs, then go ahead and have another serving on the following day. Continue all week, and watch to see if symptoms improve or worsen or neither. If they improve, try adding in more fruits, vegetables and seeds. Don't add more than one new food a day, and still keep very far away from gluten, beef, pork, corn, peanuts, processed foods, coffee, fried foods and any other common digestive hazard. Pay close attention to any reactions you get to foods. If you feel even the mildest of discomfort or fatigue after eating something, note it down! Sometimes the symptom is mild the first time, but then more and more sever with subsequent meals containing the same item. In these cases you want to either eliminate that food entirely or eat it once a month or less. Ultimately, aim to start eating much more fiber and leafy greens over time. These are needed to clean your intestines and give your body the nourishment it needs to heal. I know that finding recipes to enjoy leafy greens can be challenging (it took me years!). The good news is that it is possible. In fact, you can start enjoying a safe nutritionally complete raw foods diet within a few days by following my meal plans. These are a great follow-up to a couple weeks of an elimination diet and adding in probiotics. Yes! Stress can absolutely cause digestion! I have personally noticed a strong correlation between my food sensitivities, my digestion and my stress levels. When things were at their worst, I was often stressed about my indigestion, making the indigestion even worse of course. Fortunately, over the last decade I've found a lot of useful techniques; not just stress reducing techniques, but methods of saving money and living my dreams on a tiny income. Because of this, I've taken to a lot of traveling. I had to do it for my health! Every time I take a long trip, I literally get healthier, despite working along the way. Often I work a lot harder when I travel, and sometimes I take it easier. Either way, my energy levels increase, my digestion settles, and my food sensitivities lessen. Because of this, I've had to find ways to make traveling possible on an insanely small amount of money. People have assumed I'm rich due to my organic diet and travel-rich lifestyle, but that's not at all the case! I've been repeatedly asked about how I afford things, and I've repeatedly found that my explanation was not short, and even when I gave a long answer, it wasn't the full answer. I finally realized I had a book inside me, waiting to be born. 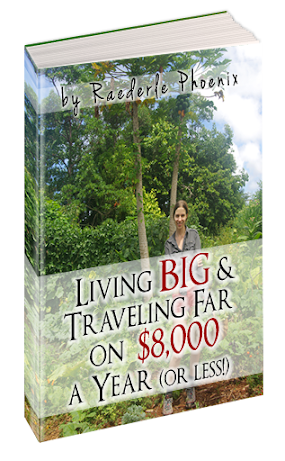 My book, Living Big & Traveling Far on $8,000 a Year (or Less!) was written to answer the question, "How can you afford an all-organic, vegetarian diet and travel five months out of each year?" It also answers the question of where I find enough time for travel, work, friends and food preparation. In this book I explain how I do it all on only $8,000 per person, yearly. That's right — traveling, organic meals, lots of free time, and now, organic clothes too! I've included every detail for how to do this in my book. Click here to learn more — because financial stress must be eliminated if you're ever going to fully heal your digestive system. Try to finish digesting before you go to sleep. This is important because digesting food causes you to release insulin. Releasing insulin interferes with releasing growth hormone, which is the normal restoritive hormone that burns fat, repairs damage and builds muscle while you sleep. So you don't want to release insulin while you sleep. You want to have an empty stomach by the time you're asleep. If you're going to bed at 10:00pm, and the last meal you eat is going to be a cooked grain, such as quinoa or t'eff, which will take three to four hours to digest, you'd want to eat that at 5:30pm, and then not eat anything else for the rest of the evening. If the last thing you eat that day is a big raw salad (using only lemon juice, fresh herbs, and spices for flavor) without any seeds, oil, nuts or avocado, then you could eat it at 8:30pm and have an empty stomach by bed time. Cooking destroys much of the antioxidant content, 90%+ of enzymes, and 80% of vitamins and minerals (including 80%+ of the vitamin C content). Raw vegetables and fruits are a 1000% more beneficial than cooked ones. Foods like steamed sweet potatoes are less likely to be a problem, for example, because they are mostly starch (not fat or protein). However, if you're suffering from acid reflux regularly, sweet potatoes might be one of the many things that will bring it on, because sweet potatoes (being mostly starch, after all) are digested with alkaline enzymes. And a too-alkaline stomach is often the cause of acid reflux. The acid/alkaline facet of digestion can be confusing with all the myths and bad information out there. One assumes that acid coming up is too much acid. But that is not the case. Just because acid is moving toward your mouth instead of staying in the stomach doesn't mean that the pH of your stomach is too low. Anti-acids make you feel better for a little while because they take the sting out of your esophagus, but long-term, they cause more of what they're trying to stop, making them a dangerous short-term "fix". Instead, calm your stomach with a little peeled cucumber or celery, which will help sooth, cool, nourish and scrub (with fiber). You don't have to peel the cucumber if you don't want to, but peeling it can help ensure that it gets fully chewed. I put my cucumber peels in the freezer and then blend them into a smoothie later. But let's get back to why a diet that is full of virtually nothing but cooked food leads to a troubled digestion (as I learned the hard way). Cooking without water (toasting, baking, frying) creates acrylamide: a very dangerous toxin. Anything that is "browned" such as bread, fried chicken, french fries or toast, has a very high level of acrylamide. This toxin is addictive because it slows you down. Toxins can repress emotions and thoughts because it is so taxing for your body to deal with. The book Raw Emotions by Angela Stokes goes into this in detail. That book and a number of other excellent books that have helped me heal are on book recommendations page. When you eat foods with acrylamide in them, you're adding a carcinogenic toxin to the chemical vat called your stomach. Not a good plan if you want to heal! This doesn't mean that you can't have delicious desserts, it just means you should opt for no-bake pies like the ones found in my books. Animals are given antibiotics, which kill off all the good flora and allow bad bacteria (like ecoli) to proliferate. Bacteria, even when cooked, is still very harmful, because 'bad bacteria' gives off 'waste'. Essentially, bacteria "poo" which is very toxic for us. Dairy, meat, eggs and peanuts all have very high levels of bacteria waste. One such waste is called "aflatoxin," which is found in high amounts in peanuts in particular. You may not be ready to give up all animal products right away, or ever, and that's fine. You don't need to give them up entirely forever. However, these foods are some the hardest to digest, and the hardest on your stomach. Back when I used to have stomach pains after every meal, I noticed that meat in particular gave me the hardest time, with beans coming as a close second. High-water content foods are more hydrating that water alone. The more juicy and watery a food is, by nature, the more oxygen it provides, the more hydration your cells receive, and the more easily-assimilated the minerals within the food. High water content foods are: melons, berries, celery, leafy greens, apples, mangoes, citrus fruits, papaya, tomatoes, bell peppers and cucumber. I mention this because I've never had a client with a stomach problem who wasn't also severely dehydrated. This doesn't necessarily mean that your particular condition can tolerate all of the foods I just listed as having high water content. In fact, some digestive conditions will react particularly negatively to melons, citrus fruits. However, if you want to heal, one of the foods on that list is a must: leafy greens. I know you probably didn't want to hear that (believe me, neither did I! ), yet it is the truth. Leafy greens are the most healing food on the Earth. Think about how many leaves an Elephant eats in a day to power its massive body. Greens are the bulk of the diet for most large mammals. What are humans? A large mammal. Leafy greens are where you want to get your protein from. This is key to healing. Other high-protein foods – such as beans – will be especially harmful to you due to the enzymes required to pull apart the dense globular proteins found in such foods. I've given three-hour lectures on the subject of protein. Here is the short of it: Vegetables offer protein in a form that is easy to digest and utilize. Beans, seeds, nuts, grains, meats, eggs, etc, offer protein in a globular form that will stress your already stressed stomach. You don't have to worry about not getting enough protein from vegetables. Athletes such as Tim Van Orden get all their protein from just fruits and vegetables with no seeds, nuts, meats or protein powders. In terms of cooked foods: aim for boiled foods. Avoid frying, baking, deep-frying, toasting, etc. Also, avoid wheat and barley. According to Dr. Ritamarie, gluten has been shown to be a problem in all cases for over 30,000 patients who had stomach discomfort. Rice noodles, millet, brown rice, t'eff, quinoa, amaranth, etc, can easily take the place of wheat products. You eat too many beans. Click here to learn why beans are a bad idea if you have IBS or gastritis. You eat too much globular protein. Click here if you're unfamiliar with what globular proteins are. You eat too many nuts. Click here to learn why nuts can be aggravating to a weakened digestion. You eat genetically modified foods. Click here to read about the impact of genetically modified foods on the body, including the nine main genetically modified crops. This article also includes other information related to calming a disturbed digestive system. If you can follow the tips I've outlined here for two weeks, I promise huge improvements. If you think this will be too much to remember or too hard to implement by yourself, consider getting a meal plan to walk you through the steps. For now, start to become aware of digestion times. Start taking note of the digestion time of a meal, and avoid combining fruits with other foods. Eating steak and potatoes at 12:00pm and then fruit at 1:00pm still counts as food-combining with fruit because the steak and potatoes will still be in the digestive system. For additional support, information, and recipes, sign up for my e-course on the bottom right. You'll receive an e-mail once or twice a week giving you critical information to improving your health and life to support your dreams. If you're not interested in the course, but do want to hear from me occasionally, sign up for my monthly newsletter on the left and you'll get an e-mail once or twice a month. Curious about how I got into all this stuff in the first place? You can read a little bit of my story and also see before and after photos here.